Marcel graduated with a Master Diploma from University of Salzburg which included joinery, upholstery and various associated trades. He then worked in his parent’s Interiors company which gave him a vast amount of experience and knowledge of different skills and application of materials. 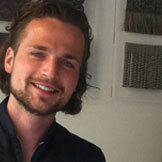 He then came to London to study the Professional Diploma at The Interior Design School. Following an internship at United Designers where he worked for 3 years on highend residential and hotel projects, he is now creative director of the Eberharter team made up of designers, craftsmen, project managers and specialist installers working on residential and commercial projects in Austria.